Due to my complete lack of motivation today, I'm posting a blog dump of completely random stuff. Enjoy! So I'm getting ready to contact our HOA Management Rep for the FIFTH TIME today. I've contacted her four times over the past 2 months about the state of our community playground. There's two ginormous holes, one of which Chase fell into head first and was (obviously) unable to get himself out. I know it doesn't look like it, but this hole is about 2 feet deep and has had standing water in the bottom of it for weeks. There's another hole by the picnic table that I feel is another safety hazard. 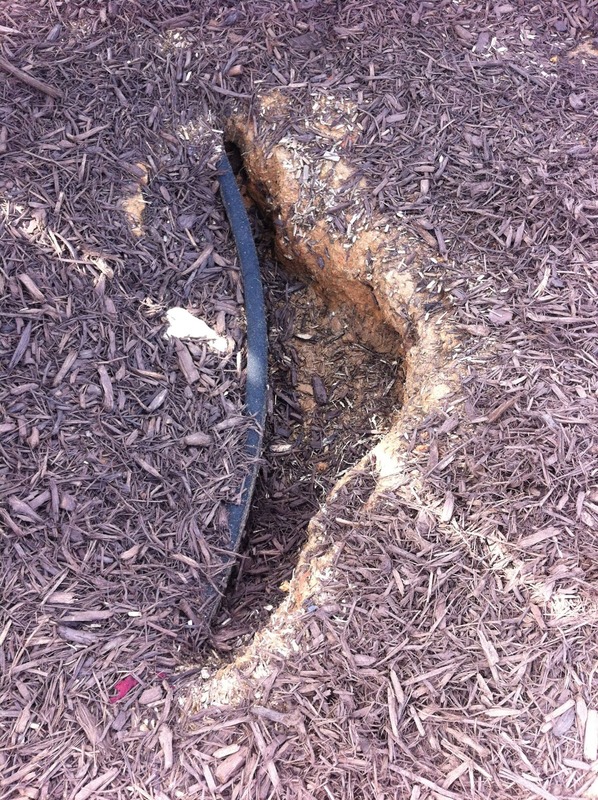 You can't see it very well, but the hole underneath the railroad tie extends into the mulch area as well. The latest and greatest find was a huge collection of wild mushrooms. I have no idea if they're poisonous or not, but they are All. Over. The. Playground. UGH! I first called our HOA contact about 2 months ago. She said she'd have the gardening crew out to fill the holes. About 2 weeks later, I called her back to tell her they still haven't been out to fix them. Then about another 2 weeks after that call, the landscapers came by and essentially put an inch of new mulch over the playground... not bothering to fill the holes. Rather than call the same lady, I left a message with another rep from her office, hoping she could get the ball rolling for me. Sadly, our HOA contact returned that call (rather than the one who I left a voicemail with) and said she'd have them out ASAP to fix the issues. 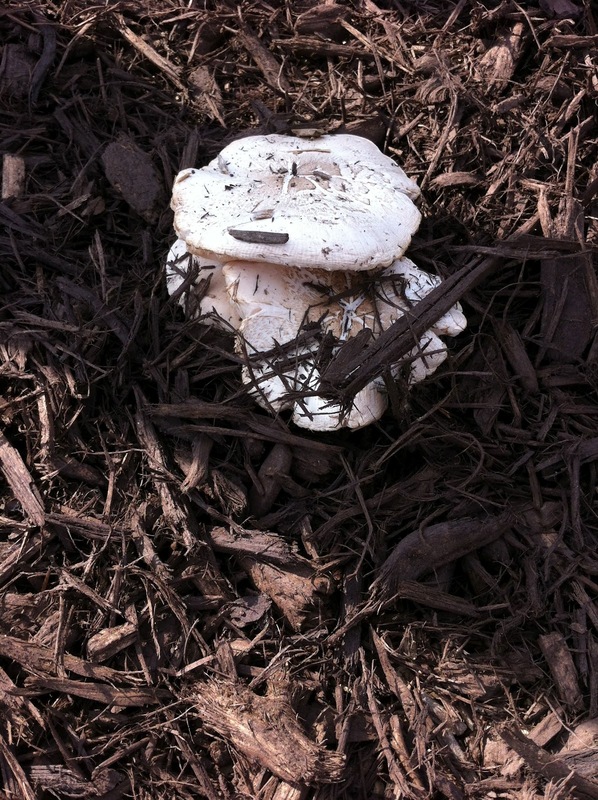 I clearly mentioned there were TWO holes to fill and now also gross mushrooms that needed to be removed as well. Later that day, I was at the pool with the kids and my mom, and we noticed a guy on the playground. People, he essentially filled the one hole by the slide (that Chase fell into) with MULCH and left. 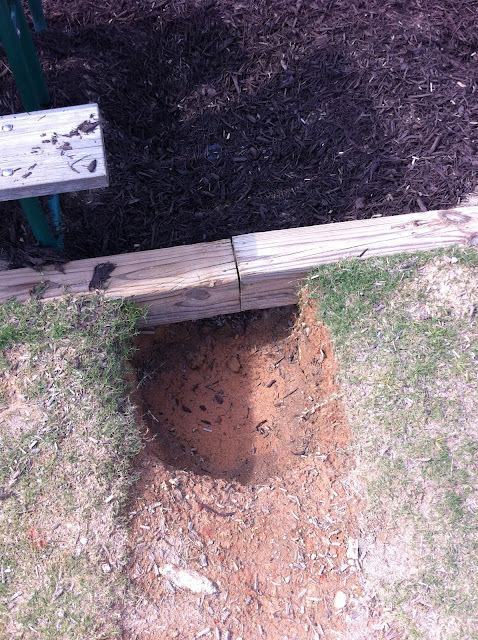 So as of right now, we still have a huge hole by the picnic table, and we still have grody mushrooms everywhere. And I'm pretty sure that hole by the slide that was filled in with mulch will be dug out again by some of the older kids that use the playground. Lovely. So I'll be calling the HOA management company again... for the FIFTH time. Speaking of Grrrrr, can I just say that somehow our kitchen has become infested with gnats?! Nasty, right?!?! I have no idea how or when it started, but we are desperately trying to get to the root of the problem and get it taken care of. We found online where people said to mix a few drops of dish soap with apple cider vinegar, cover with cling wrap and poke some holes in it, and it will attract the gnats in, but they can't get back out. It's worked like crazy, and we've had dozens of gnat carcasses end up in the dish. But they still keep coming!! We've temporarily eliminated our recycle bin, are keeping the trash emptied often, and have been cleaning the crap out of the kitchen. It's SO frustrating because it seems like we've had one thing after another that's kept me from using my gorgeous kitchen (we had an ant problem, then the backsplash project that took 3 weeks, and now gnats), so I'm just not cooking or baking NEARLY as much as I'd love to! VERY frustrating!!!!!! On a happier note, I did get myself into the kitchen Sunday morning to make some homemade blueberry waffles for Father's Day. It was a recipe from Williams-Sonoma that was pretty good, but probably not one I'd use again. 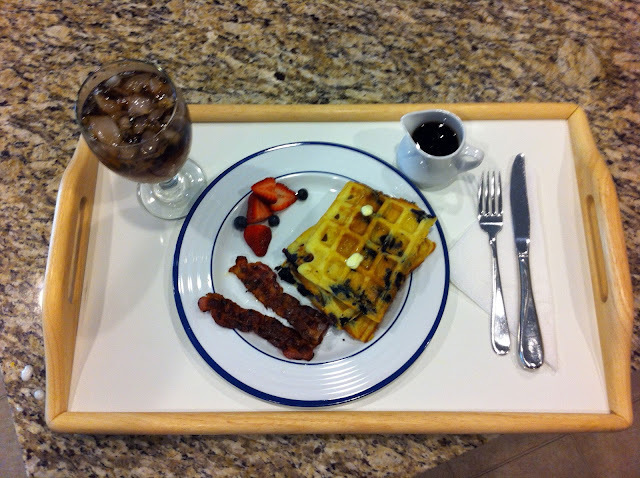 The kids and I woke daddy up around 8:30 AM to bring him breakfast in bed. Yum! After breakfast, it was present time! Mommy Daddy is now the proud owner of a Cuisinart ice cream & frozen yogurt maker! Woot! Also, I'm pretty sure I picked up a gift for daddy that is quite possibly the FIRST purchase for daddy to use in the house. I've bought a ton of things for the house that I wanted, but I finally picked up something from daddy's very short wish list -- an extending shaving mirror. He's so easy to please! 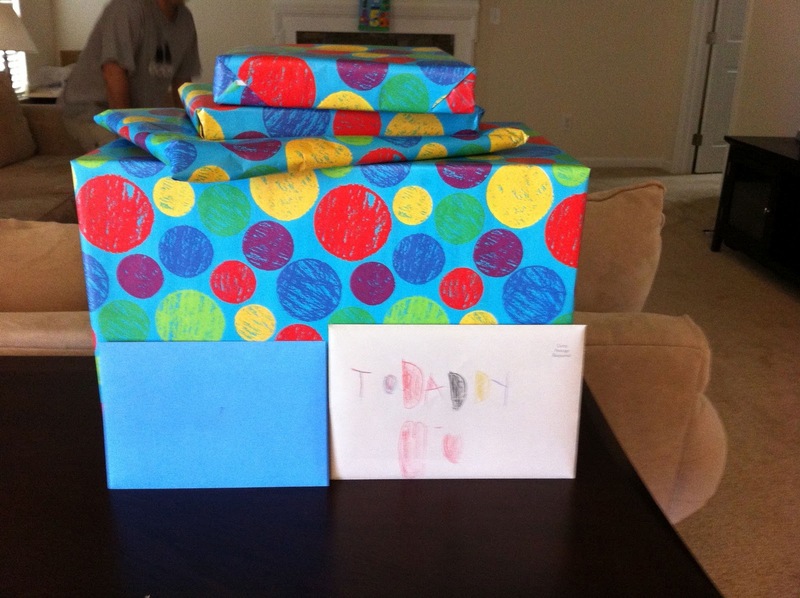 After presents we finally went to see Madagascar 3 and we all loved it! Then it was home for lunch and naps, followed by a family trip to the pool! We had a wonderful day and I truly hope hubs enjoyed his day and knows how special he truly is. 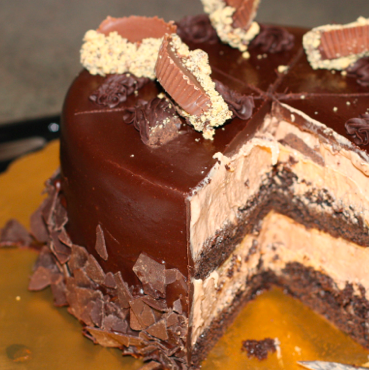 Oh, and of course I can't forget his Cold Stone cake... chocolate cake, chocolate ice cream with Reese's peanut butter cups, Butterfinger and Heath mixed in, surrounded in chocolate ganache with chocolate curls around the outside and topped with more peanut butter cups! It was DELISH! Of course there wasn't time to take a photo of the actual cake before it was demolished, but it looked kind of like this, only waaaaay better! My last random rambling point has to do with Groupons, but I feel that it deserves a post of its own, so stay tuned! !